I am so happy to share with you a new Spanish reading resource for beginning readers. Doodles and Kreations is the creation of two PreK bilingual teachers, Kim Jungman Fails and Debby Patterson. Together they have over 30 years of experience teaching Spanish-speaking children who come to school not speaking English. Based on their experiences, Kim and Debby are putting together fun and clever materials to teach beginning sounds to Spanish speaking little ones. The students learn the sounds, then Kim and Debby offer activities that teach them to put the sounds together to start reading. So many of you are always asking me about resources for teaching children to read in Spanish. Do you remember the bilingual alphabet and number booklets in Spanish from DJ Inkers that I featured last year? Well, Kim is the one who designed them. You can find all of Kim and Debby's Spanish-language education materials in their TeachersPayTeachers Store, and even download a free copy of their insanely cute Spanish alphabet charts so you can get an idea of the quality of their products. I would also encourage you to visit their blog, http://spanishbeginnningsounds.blogspot.com/ which is devoted to teaching beginning sounds in Spanish. There they share some really creative activities and printables that you can download or purchase. But the most exciting thing to me is that the two of them are working on a whole system for teaching beginning sounds. Their mascot is Pepe Pato, an adorable little duck who makes sounds. 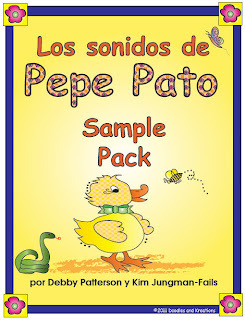 Over the last year or so, Kim and Debby have worked to create the program Los Sonidos de Pepe Pato. And in honor of Hispanic Heritage Month, they have put together a sample packet with a little bit of all their Pepe Pato activities - just for MommyMaestra readers. Please note that this is a big file, even though it is only 16 pages, so you need a good connection. And if you do, please take a moment to leave a comment below for Kim & Debby. Oh this is great!! I've been teaching my older kids to read in Spanish like they learned in English...easy reader type styles. Thanks for another great resource!! You're welcome! I'm happy to share!